You can display images from these ACF Gallery fields using AE - ACF Gallery widget. With this, you have an option to display multiple images in the form of grid or carousal. AE - ACF Gallery has many Layout options through which you can adjust the setting according to your creativity level. Custom Field Name: In this, you have to enter the field name. Image Size: select the image size for your gallery. 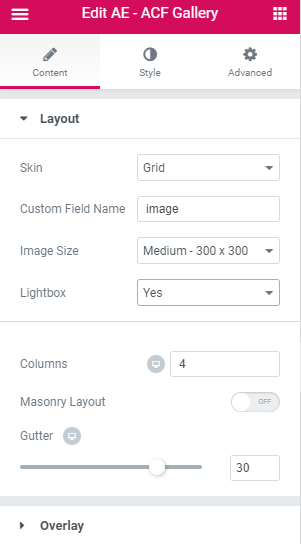 Lightbox: With this option, the Gallery images will be displayed by filling the screen, and dimming out the rest of the Post/page. Columns: Here you have to input the size of the column you want for your grid format. Masonry Layout: It is used to present the images seamlessly. Gutter: With a gutter option you can create space between two columns. Slides Per View: Here you can add slides to your Carousel according to the pictures you are adding to the gallery. Speed: You can increase/decrease the speed of your Carousel slides. Autoplay: Enable Autoplay and it will automatically play The gallery as you open your Post/Page. Duration: Here you can decide the duration of your autoplay slides. Effects: Choose the Effect of your Carousel which will be shown on the frontend i.e. Slides, Coverflow. Space Between Slides: you can increase/decrease the space between two slides from this option. Loop: It will continuously play the Carousel in a loop. Zoom: In this, the Carousel images will be displayed in the zoom mode. Pagination Type: add a type for the Pagination i.e. Bullets, None, Fractions, Progress. This will be shown at the bottom of your gallery. Previous/Next Button: From this, you can add Previous/Next Button to your gallery to move the gallery images. Keyboard Images: Here you can control your gallery from the keyboard buttons. Scrollbar: If you enable this than the scrollbar will be visible at the bottom of your gallery.